Dave Harris played tenor sax in Scott's legendary late 1930s six-man Quintette. In 40 years as a highly sought horn-for-hire in New York and L.A., Harris (1913-2002) released only one record as a bandleader: DINNER MUSIC FOR A PACK OF HUNGRY CANNIBALS, a 1961 tribute to his old boss, for whom he held deep respect. Basta recently released this long out of print album on CD. After the RSQ, Harris remained with Scott's first swing band, then compiled an impressive resume as a session player on radio and TV, and in the recording studio. In a career that extended into the 1970s, he worked with Billie Holiday, Gene Krupa, Eddie Cantor, Mickey Katz, Stan Webb, Russ Case, Bob Haggart, and countless others. In late-life interviews, Scott claimed that his 1937-39 Quintette was his favorite band. That opinion was doubtless shared by Harris, who (unlike dozens of embittered RS sidemen) always spoke fondly of working under Scott. Such was Harris's affection that his sole outing as a leader was an album of RSQ favorites in modern high fidelity, with a sextet dubbed The Powerhouse Five. The ensemble recaptured the manic elegance and rhythmic wit of the composer. Nostalgia was the inspiration, but sharp musicianship and a celebratory gusto mark this album as a missing link in the Scott legacy. It was a pretty band. It wasn't a swing band and it wasn't a jazz band, it was a good band with a good bunch of guys. Scott was a little eccentric. He'd make a guy stand up and play third alto, all by himself, all the way through. And then he'd say, "Why don't you go take some lessons?" He got on my nerves a little. 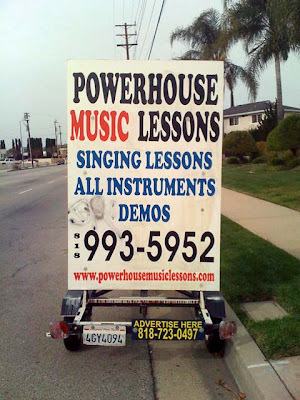 We'd rehearse and rehearse and rehearse. We didn't need that much rehearsal. I think he just liked to hear the band. Quoted in The Swing Era: Vintage Years of Humor, Time-Life Records, 1971, Scott profile by Michèle Wood. Photo by Les Deutsch, 2009. 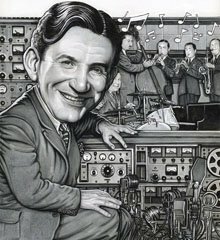 In the 1960s, Raymond Scott coined the term "Tele-Tones" to describe what we now call ringtones. 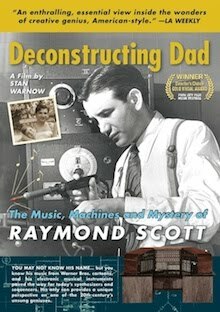 Thanks to musician, arranger, and RS fan Les Deutsch, you can now download free Raymond Scott ringtones formatted specifically for iPhone. Details from Les: "I could have converted the original recordings to ringtones, but I really enjoy the quirky synthesizer sounds that the Mac’s internal QuickTime app generates directly from Finale." "Animated By His New Project"
A student of electronics by day and a drummer around Glasgow by night, Brown transcribed some of Scott's work for a band he was then playing with and promised himself that he would one day organise a fully-fledged project playing Scott's music, of which, he was discovering, there was rather a lot, and in different styles, too. "The problem with the Quintette is that Scott didn't write stuff down at that time," says Brown. "There's the odd sketch but mostly what he'd do was play his ideas at the piano, get the band to learn the pieces by ear and then record them. The music was never actually written with these instruments in mind and he'd basically cut and paste his ideas into compositions. 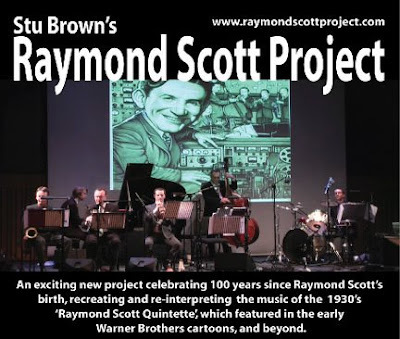 So I had to transcribe a lot of old recordings and arrange them for the band we now call the Raymond Scott Project." Watch the band perform "Devil Drums" in London last October. 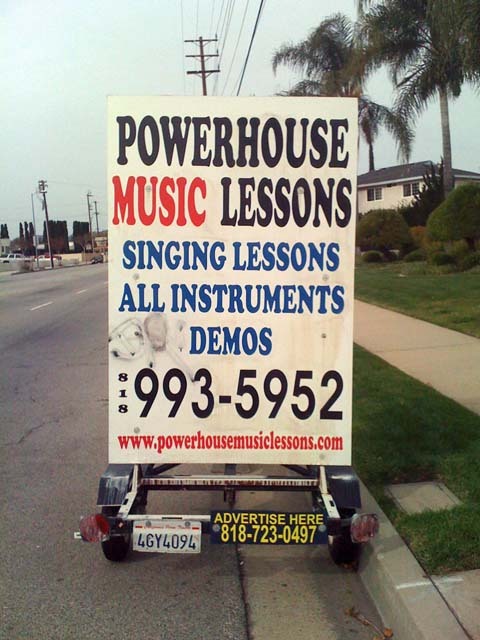 G-Town Radio Special:"Getting Ahead of Ourselves"